For months, Ivy has been asking when she could start ballet. 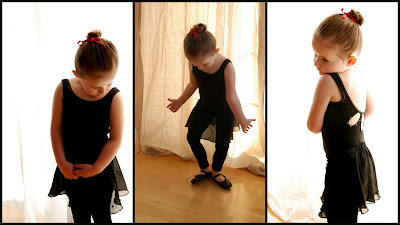 I spoke to one ballet school and they said they don't start girls until they are 3 years old. I thought that that sounded like a good target date. She doesn't get to start primary at church, so dance would be a good stepping stone for social skills. So, I told Ivy that when she turns 3 she can start ballet. Little did I know that for months she would tell the world that in January she would get to start ballet. If someone asked her how old she was, she would answer, "I'm 2 but almost 3 and I get to start ballet in January, when I'm 3." A couple of nights before she started her dance class, she and I went to the dance store. Jade has several Leos that she wore to gymnastics and dance, but I wanted Ivy to be excited about her outfits and pick out her own. 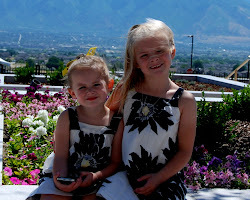 We went to "The Glass Slipper" in American Fork. It is such a cute little store. They have a whole room of just black Leos. She picked an adorable purple Leo and a stunning black one. They didn't have pink ballet slippers, so she got black. They are now her "favorite color for ballet slippers." Saturday morning, she was up and eager to get ready for dance. Since this day will go down in history as "The Day Ivy Started Dance," I had to do a quick photo shoot. She is such a beautiful little girl. I love the picture in the middle, where she is trying so hard to do "first zition" (for those of you who do not speak Ivy-nese, that is first position). Scott and Jade joined me and Ivy for her first class. We had a little talk about how important it is to really pay attention and do everything the teacher asks her to do. She was bouncing off the walls, she was so excited. She was fantastic the whole class. She never got distracted or confused. As soon as class was over, she came running out and said "I did everything my teacher asked me to do and I did a good job in my ballet class." I had her go back and say a big "thank you" to Miss Alexis, her teacher. 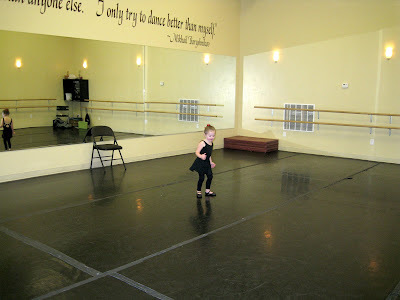 Every day, since her first lesson, she asks if she can go to dance class today. And every day I get to tell her "on Saturday" and explain how many days that is. Now, anytime someone asks Ivy how old she is, she answers, "I'm three and I'm in ballet class." If you ask her if she is a little girl, she answers, "No, I'm a ballet girl." 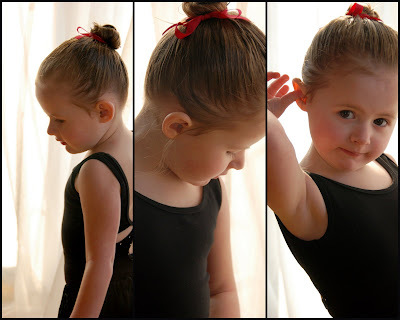 Please please please let me be worthy to be a mother to an exquisitely adorable ballet girl like Ivy someday! I told Kat I was reading my journal the other day from when I lived with Carole and "babysat new borns". I could not get enough of "my baby Jade". At one point I said that Scott was mad because only I could get Jade to smile! Awww good times! I remember sitting outside in the warm spring air with her sweet self in my arms reading a good book. YOU made that brief chapter in my life a treasure I hold dear. Thank you. We loved having you as Jade's nanny. We have such fun memories of the two of you. And cute pictures that you took are in her photo album. I remember coming upstairs to see the two of you on her blanket reading a story to her. Thank you for helping me be okay with working while I had a newborn. You made it do-able and we will always love you. I love the dance pictures. The girls are so cute. The new style is nice as well. Very pretty... good thing you don't have any boys. I hated ballet as a little girl. But, Ivy definitely makes me want to be a ballet girl! 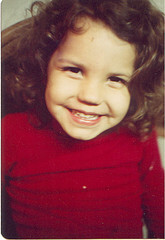 She is such an adorable girl.....I need to come see your girls soon before they are all grown up!